The Yellow Tang is one of the most common saltwater fish, because of their striking color, fantastic shape, bold personalities and relative ease of care. They will add a pop of color to even the brightest reef tank. They are, (not surprisingly), yellow in color (shocking…I know), ranging from a pastel-y buttery color to an almost neon color that changes based on age, season and time of day. Don’t be alarmed if the fish looks dull at night because these fish become a dull almost grey-ish color at night to aid in camouflage when they bed down. I know I was freaked out the first few times I saw that. They are disc-shaped with almost equal height and length when all seven of their fins are fully extended. They have sharp white spines on their tales for self-defense which is the only part of them that is not yellow. Known for being outgoing, generally friendly fish, yellow tangs need lots of room to swim and a space ready for them to grow into. They are reef compatible herbivores with a seemingly natural curiosity. The scientific name of the yellow tang is Zebrasoma flavescens. Common names include Yellow Sailfin Tang, Lemon Surgeonfish, Yellow Surgeonfish, and Yellow Hawaiian Tang. Yellow tangs live in subtropical waters from the Western Coast of Hawaii to the Eastern Coast of Japan. 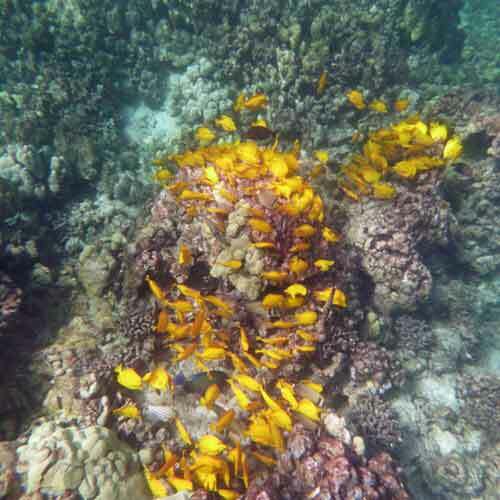 Their main population is found in Hawaii and the majority of all yellow tangs caught come from the Kona Region (The West Coast of the Big Island). They inhabit coral reefs and shallow waters near the continental shelf. They tend to live lower in the water column where the water is calmer. Juvenile yellow tangs tend to live in deeper waters farther from the reefs with their move into the shallower coral reefs corresponding with them reaching sexual maturity. Yellow tangs have historically been Hawaii’s largest fish export making up 80% off all fish caught for aquarium trade off its Coasts. In 1990, Fish Replenishment Areas were set up off the Kona Coast which prevents the collection of fish for aquarium sales in 30% of the area. At this time, the Tang’s population is listed as stable and there is no shortage of specimens in the areas where the collection is allowed. The yellow tang will likely remain one of the most popular, as long as the legislation allows. Yellow tangs often arrive at pet stores small (sometimes 2 inches or smaller), but it is important to keep in mind that these tiny little rays of sunshine can grow to be 8-inch fish who are quick swimmers requiring lots of room to move around. Tangs are bold and active fish that will be very visible in your tank during the day. and sleep at night). They are in need of space to swim about freely in the upper portion of the tank during their active periods but need rocks and coral at the bottom of the tank to hide in at night. Because of their need for swimming room and constant motion, the best yellow tang tank size is one that is at least 100 gallons in volume, or larger. Determining the minimum appropriate tank size for tangs is one of the larger controversies/debates in the hobby. Some sources recommend that fully-grown tangs need at least 6 feet of linear open space to swim in. 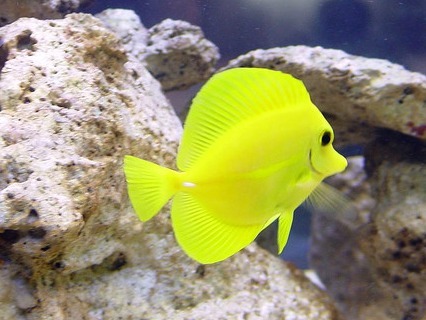 Chat forums for hobbyists seem to have groups of yellow tang vigilantes who have made it their mission to protect tangs from tanks that are too small. To be safe on the forums and avoid getting shamed, don’t keep tangs in tanks under 100 gallons and make sure they have lots of free space to swim in the open! Yellow tangs are generally considered to be “Semi-Aggressive” in temperament. In my experience with this fish (I’ve had a few over the years), that means that they will get along almost all of the time, with almost all of the other fish. But there will occasionally be fish that they just can’t stand, for some reason and they may chase, harass, bully and even slash (that’s right, slash!) those other fish. It is generally not recommended to have more than one surgeonfish in a typical aquarium, although there are lots of reports about people successfully keeping 3 or more. If you plan to introduce more than one Surgeonfish (of any variety) into your tank, it is generally thought to be best to add them all at the same time. In that way, no one fish has a chance to establish the tank as ‘their territory’ before the others. They can then establish their own pecking order naturally and sometimes can peacefully coexist. Other times, it ends badly, as I’ve written about in a previous post. Take a look at that image above. Sad. They are reef compatible, and will generally not nip at the fleshy polyps of corals, but some of the more bold individuals can sometimes harm corals by disturbing them so often with their aggressive feeding. The tangs are eating algae, not corals, but in their zest for the ultimate vegan meal, the can sometimes upset the apple cart. Yellow tangs in the wild are schooling fish, living solo as when young and moving into large loose shoals as they reach maturity. In a large enough tank, 3 or more yellow tangs will form schools playing follow the leader up and down the length of the tank. During their active hours, wild yellow tangs are constantly on the move picking bits of algae off of the rocks and aquarium glass. Their bold temperament and active lifestyle make them a good addition to a tank for their entertainment value alone. Tangs do have large sharp white scales near their tails which they display when threatened and use to protect themselves. Male fish, in particular, will fan out all their fins to achieve their maximum size before displaying their scalpel-like scales in displays of aggression. When they want to be semi-aggressive, they will put that scalpel to no-good use, swatting it at a rival fish with intent to maim. Over the years, I’ve had a few fish end up with a cut as a result of a tangle with them. Yellow tang will display mating behavior in captivity but have thus far proven impossible to propagate in a tank. (Researchers in 2015 managed to grow fish from their larval stage in an aquarium, but no other successes have been reported). Both males and females have very similar appearances, but during mating, males change color and display a shimmering behavior. With their beak-like snouts and narrow faces, yellow tangs were built for eating algae out of crevices in coral and between rocks. Their daily routine is pretty much built around grazing and eating all day long. They need to have access to lots of algae and other plant-based food sources. They are herbivores by nature and will gladly snack on nori and other seaweed-based food options. To give them the most natural access to this food source it is a good idea to distribute it around the tank tucking it under rocks and creating opportunities for them to find it. The tangs in my tank also tended to eat spirulina flakes aggressively, too. Even though their preferred/natural food is plant-based, that won’t stop them from eating meat-based foods. My tangs greedily ate mysid shrimp, blackworms and brine shrimp, as well. To keep them happy and healthy, they should be fed at least 3 times a week, although most people will try to feed them daily. These fish are susceptible to ich and many other parasites. 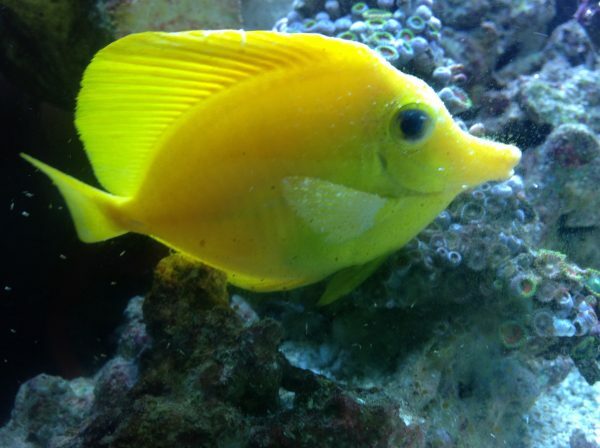 A quick scan of some hobby forums will turn up many examples of parasites in yellow tangs, in fact, it is startling how many of the example pictures of diseased fish are yellow tang. A quarantine tank is necessary for any hobbyist, but it seems to be more important if you are getting yellow tangs. It is important to quarantine them before introducing them into your display tank. All yellow tangs are wild caught and can come diseased from the ocean. They seem to be parasite magnets, picking up critters somewhere along their journey. These are online stores that will ship them, via overnight delivery, right to your door. The other way, of course, is to head to your local fish store. Be sure to follow proper acclimation and quarantine procedures, to give your new purchase the best chance and to ensure you have access to any live arrival guarantees. If you haven’t already considered adding a yellow tang to your collection, you should. They’ve been an enjoyable and vibrant part of my tank for most of the years I’ve had it. Why do I love them so much? There is no shortage of reasons why the yellow tang is one of the most common fish in hobby aquariums. But keep in mind, while they are easy to care for, they do have some special considerations. They are susceptible to disease, prone to aggression in some cases and can sometimes cause problems for some types of coral because of their feeding habits. If treated properly, the yellow tang fish will add color and character to your display tank for many years to come, because they can live as long as 10 years! 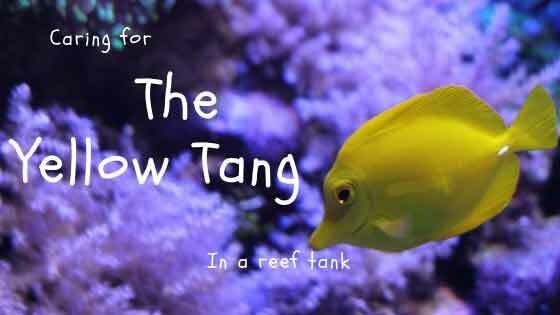 Have any questions about caring for the yellow tang? If so, please ask it in the comments below.